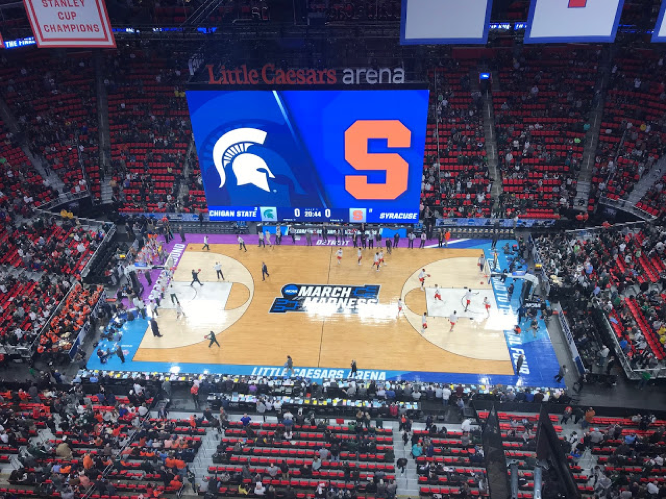 DETROIT, MI – Down to the last wire, Syracuse Orange upset the No. 3 seed Michigan St. Spartans with a 55-53 win in the second round of the 2018 NCAA Men’s Basketball Tournament. Syracuse struggled grabbing offensive boards. The Spartans powered through and dominated the Orange against the glass. Michigan State had 29 offensive rebounds against Syracuse’s seven. It was a closer match-up defensively, as Syracuse had 23 defensive rebounds and the Spartans had 22. Overall, being out rebounded 51-30 was a true test for the Syracuse offense to make up for lost second chance points. Syracuse was only able to grab five second chance points, which meant that they had to drive to the basket or find open looks from outside the arc. In the paint, Syracuse only scored 12 points and shot 1-8 from the three-point line. The Syracuse offense dominated the first half shooting 40 percent from the field over Michigan State’s 28 percent. Despite the Spartans starting the second half strong, they ended the game shooting only 25 percent from the field. Michigan State didn’t score a field goal in the last four minutes of the game. This was a true testament of just how strong the 2-3 zone defense can be. Spartans offense couldn’t quite figure out how to get passed the powerful 2-3 zone and were forced to get points from outside the arc. Something that was close to impossible as they shot 8-37 from the three-point line. Spartans star shooter Miles Bridges was held to only 3 points in the first half, ending with 11 total. He shot 3-12 from beyond the arc. Other top scorers for Michigan State were Cassius Winston with 15 points and Nick Ward with 11 points. With one of three top scorers for the Orange, Frank Howard, fouling out, Syracuse held onto the edge of their seat. Howard had scored 13 points for the Orange and fouled out with six minutes remaining in the second half. As the Orange trailed by two, walk-on Braedon Bayer made his NCAA Tournament debut for the Orange and helped solidify the 2-3 zone. Syracuse was up by one point with two minutes left and Bayer came up with a huge block against Spartans Miles Bridges. “Braedon came in, hadn’t played much the entire year, stepped up and played some great defense,” Tyus Battle said. Without Howard, there was no telling how the cards were going to fall for the Orange. Battle and Oshae Brissett made some clutch shots to give Syracuse the edge over Michigan St.
Syracuse travel to Omaha, Nebraska where they will play ACC opponent Duke Blue Devils in the Sweet 16. Just a week ago Syracuse was anxiously waiting to see if they were in the NCAA Tournament. Now, despite everyone’s cloud of doubt, they are moving forward.